If you take a walk down to Aderhold, you’ll find yourself surrounded by a slew of restaurants. You might be looking for great food, affordable meals, a nice atmosphere or good company. The following joints have all of the above, and are in walking distance of campus. Slice is the downtown pizza joint. Everything about Slice is urban cool; from the slightly decaying warehouse décor to the indie-pop laden soundtrack kept a’ spinnin’, this pizza place seems like a Brooklyn export delivered right here to our very own Peachtree City. The ceilings are vaulted, the bar boasts a colorful array of drink selections and the menu is of the pared-down variety – simple and to the point. If you thought Slice was trendy when you walked in, you might be surprised to find that the menu is not. In fact, it’s pretty damn basic, but if you’re looking for good eats, you’ll score at Slice. The appetizers range from bready to cheesy. The breadsticks are phenomenally simple, but doused in a coating of garlic butter yumminess, and served with a tasty, spicy marinara sauce. Slice covers all the bases when it comes to Italo-American faire, without the gimmick-y Godfather references. They simply implement cues from the cuisine and take a down-to-Mars approach. Salads, sandwiches and classic entrees such as lasagna and chicken parmesan are basic as basic can be; I was relieved not to find quinoa anywhere on the menu. 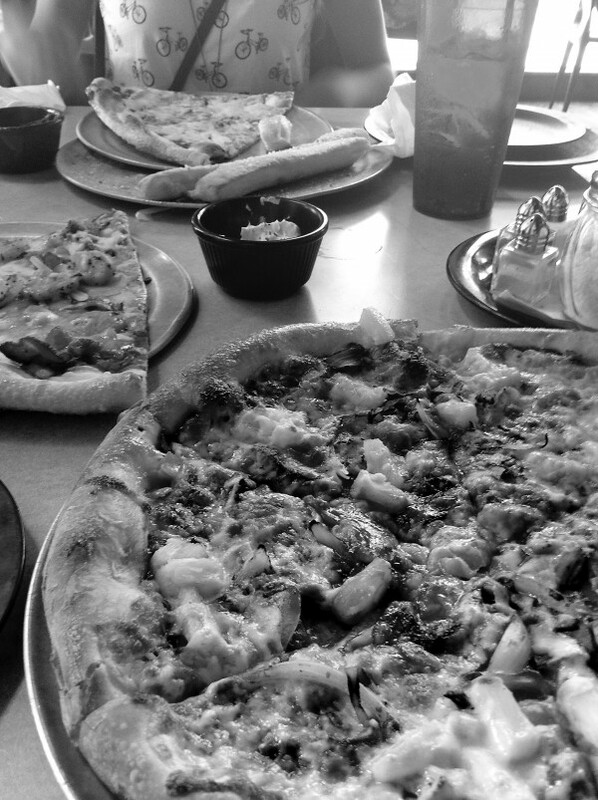 Without a doubt order the pizza; it’s all delicious. You can opt to build your own pie with a wide array of toppings, or go all out with a specialty pie. The loaded baked potato, with its red sauce base, bacon and potato-round topping, and its side of sour cream, make for a decadent. The Hawaiian barbeque is delicious as well. Be warned: a slice of Slice’s pizza and a draft beer (Blue Moon pairs nicely) was enough to send me into a food-induced coma. My only complaints about slice? The service was meh, and the crust was a little dry for my taste, but overall Slice is an A. They also have a $5.50 slice/salad combo Monday through Friday from 2-5pm, Monday night poker games and other specials throughout the week. Naan Stop, the former food truck-turned-sensation, received hype earlier this year for its appearance on Anthony Bourdain’s newest venture: The Layover. What started as the effort of two brothers on a mission to bring their mother’s Indian cuisine into the easily-edible, everyday eats category, Naan Stop now has brick and mortar store just off Broad Street. A glance at Naan Stop’s menu might make you sigh in relief – it’s cheap like many other similar-minded places (Jimmy John’s, Moe’s) in the immediate area. But unlike the restaurant chains and fast-food dives, Naan Stop has the best homemade naan this side of town. The setup is just like Subway, except here you choose your base of naan, rice or salad to pile your protein and toppings on. My favorites were the seasoned chicken tikka masala and the unique texture/flavor combo of the paneer (Indian cheese) tikka masala. The sauces are what really steal the spotlight at Naan Stop. From the cool cucumber-yogurt to the dead spicy chili-cilantro, it’s almost impossible to choose just one or two sauces. Beware: the more sauces you choose, the more napkins you will need. 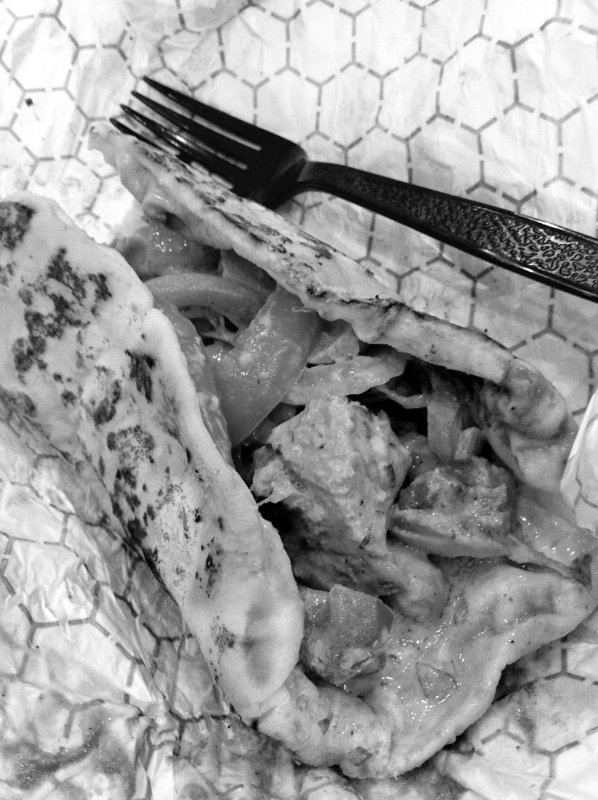 Naan Stop’s naanwich could win Atlanta’s messiest lunch award (if there were such a thing), albeit messy, flavorful goodness. A delicious side comes in the form of samosa, a fried pocket of texture with a savory filling of potatoes, peas and onions , served with a side of dipping sauce. I tried it with the sweet apple-tamarind and coconut-mint chutneys and was not disappointed. I finished off my meal with a mango lassi, a yogurt and mango smoothie with cinnamon and cardamom on top. I then craved one for the next few days, and had to return as soon as possible to reward myself with another mouthwatering lassi.